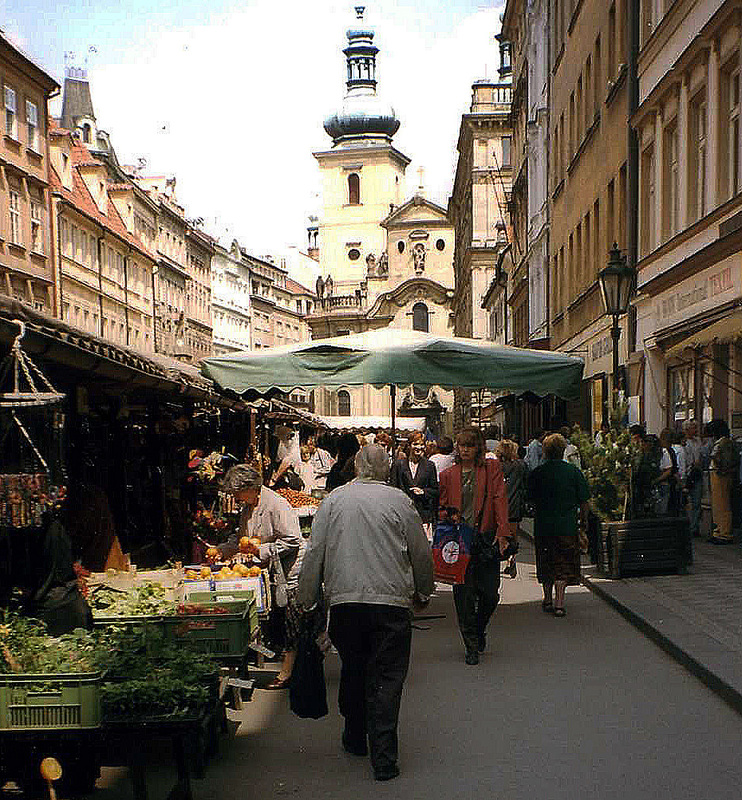 Even after my fiasco in Firenze, and perhaps partly because of being redeemed in Roma, it wasn't long before I headed back across the Atlantic, this time to the Czech Republic, specifically to the great city of Prague. 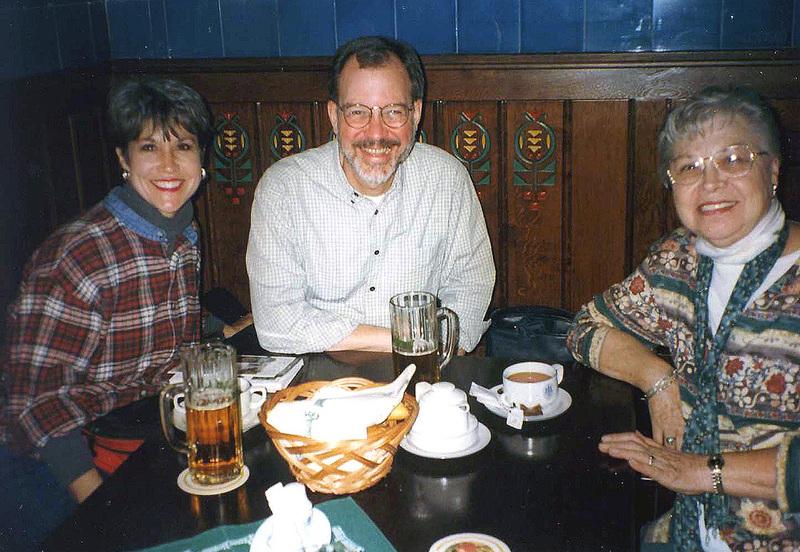 I was accompanied again by my mother, and my sister Judy came along as well. We traveled to explore our roots. Dottore Gianni stops me at this point to remind me that our roots more than likely lie not in the Czech Republic but in Slovakia. I always listen to and respect the good doctor, but while theories abound (among me and my relatives only, it's not exactly of national or international importance) as to exactly where in the land that was once Czechoslovakia, and before that a portion of the Austro-Hungarian Empire, the Pastir clan lived before a few of them emigrated, we are still not, and may never be, sure. A lucky accident via the social networking site known as Facebook (do any of you know it? A rather insipid cyber-place, for the most part, though on occasion it can prove useful), pointed us to the exact village in Croatia...well, make that Herzegovina - the map of Europe has been re-drawn more times than almost anyone would want to count - that is the root source of the Hrkach clan. Alas no such luck from the Pastir side of the family. So while a true search for our roots might better have begun in Bratislava, Prague is the jewel in the crown of this part of Europe, that one-time capital of the Hapsburgs and Holy Roman Empire was our destination. Once again, I quote from my journal scribbled during the trip, accompanied by photos from the week we spent there as well. Ground rules, again, for anyone who's not yet read this series of the ups and downs of my international travels: all journal notes are enclosed in quotation marks. If I choose to comment in the midst of the quoted notes from the present, I will enclose those remarks in brackets ([ ]), and in separate paragraphs not enclosed in quotation marks discuss in abbreviated form what I wrote in the general. Admittedly not every word is eloquent! Saturday 16 May 1998: "Arrived in NYC last night after far too long a bus ride - note to self: NEVER catch a 12:40 bus from Ithaca that arrives in Manhattan during a Friday rush hour!" Monday 18 May 11:30 pm: "We are at last flying over the Atlantic! I met mom and Judy at the airport [Judy flew in from LA, mom from Florida], and after a little madness - at LAX the ticket taker tore the wrong portion of Judy's ticket and she had no return ticket from Prague! [potential Giù!] Fixed now [whew! A Su!] - we boarded the Czech Air flight...and then we waited...we were delayed two hours because the rear toilets on the plane were not functioning! [potential poo-poo Giù!] But now we've dined aboard the flight and after a very late start we are approximately four and a half hours from our destination - PRAHA!" NO fear! 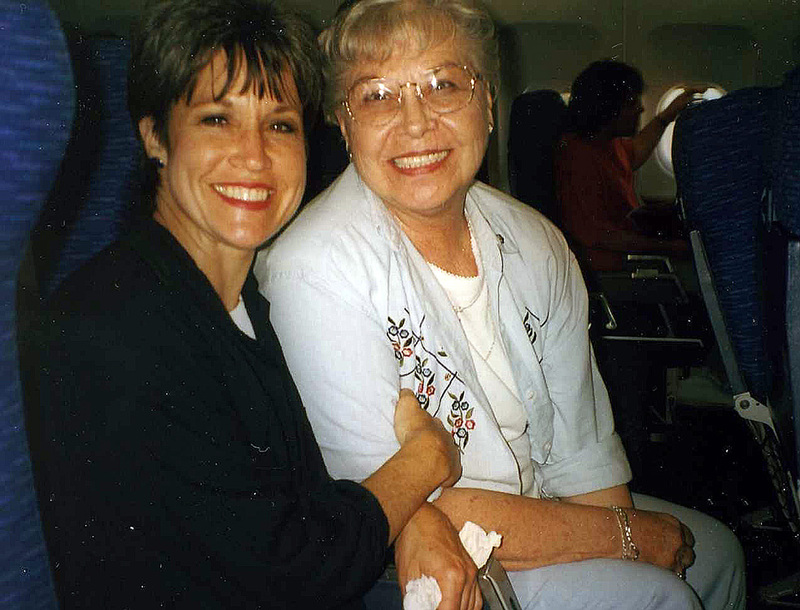 My sister Judy and my mother on the plane waiting for take-off! 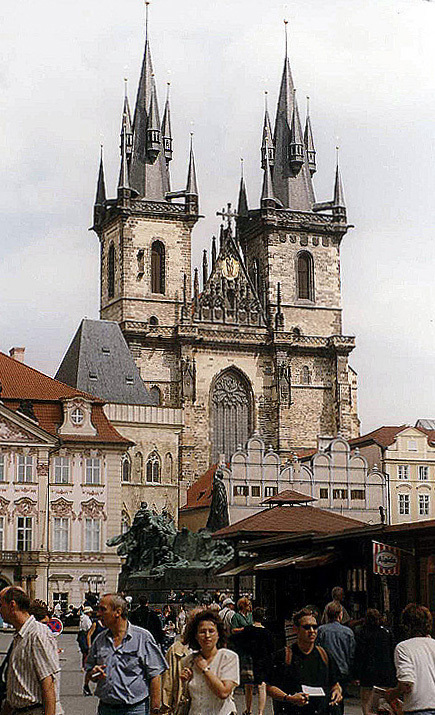 Tuesday 19 May: "We are in Prague at last! Our guide Alex picked us up at the airport and drove us to our hotel, offering a good bit of description about the city on the way. He'll pick us up tomorrow at 9 am for a three-hour walking tour. Mom and Judy are sharing a room, and I'm in a room of my own - a very nice one. I had a terrific shower and immediately after went out to reconnoiter. I found the nearest Metro stop, Dejvická, only ten minutes' walk from the gigantic soviet idea of splendiferous hotel [I remember from 2014 that it was called the President, at least I'm fairly certain of that, sad to say a tad out of the center of the old town]. 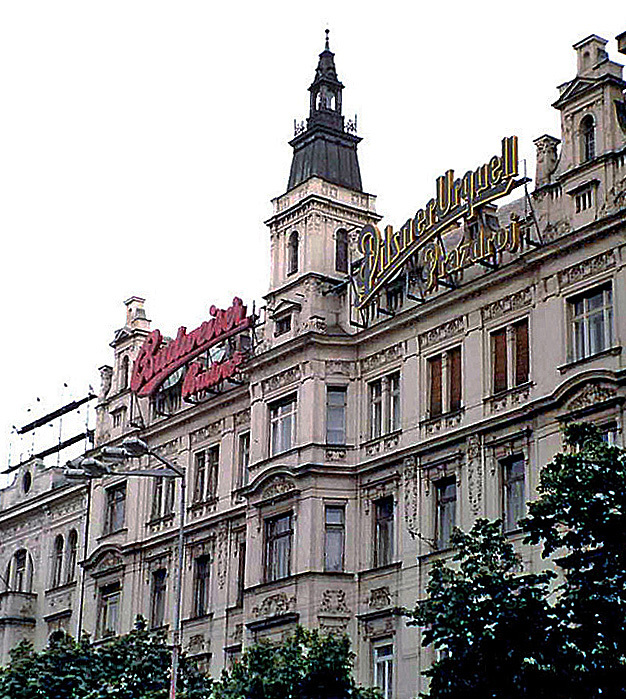 Once there I used my almost non-existent Czech to buy a ticket and rode the Metro to the Hrad stop, walked towards the castle, then walked back down, found my way back to the hotel and met Judy and mom there, We dined at a restaurant called Harlekin (nice theatrical name, yes? ), an unassuming place where we ate excellent pork - a real find, only two blocks from the hotel!" 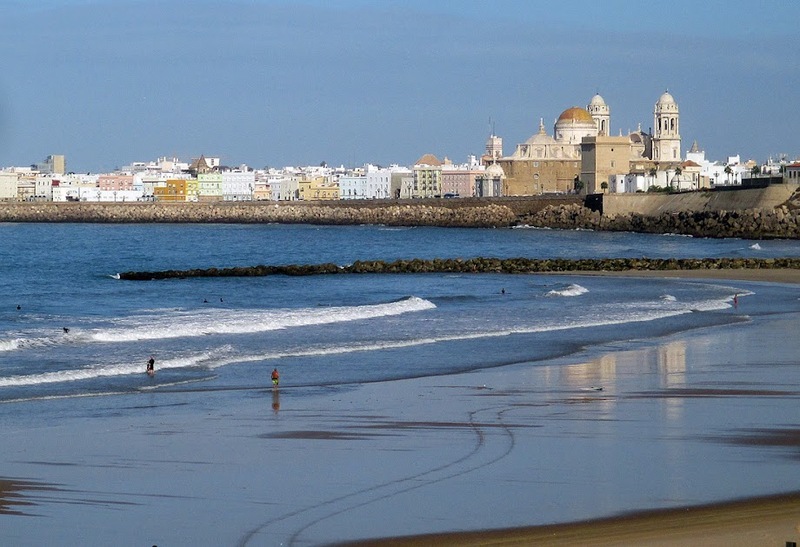 "Looking very much forward to the tour tomorrow morning as it will give us a good overview of the city. I also hope to buy some opera tickets...I'd be more descriptive, but I am falling asleep writing..."
Wednesday 20 May, 3:30 pm: I awoke feeling pretty awful, but felt better after breakfast at the hotel. We met our guide - named Alex - who took us on a wonderful tour of major sights/sites of Prague, starting at one of its highest points, first to Loreto, then a stroll around St. Vitus Cathedral and Hradčany Castle. [I'm not sure why I didn't mention this in my journal, so I will now in 2014. I was worried that mom would tire very quickly on this long walking tour, so I asked Alex to begin the tour at its highest point, so that most of the actual walking would be downhill or on a flat, and he readily obliged.] 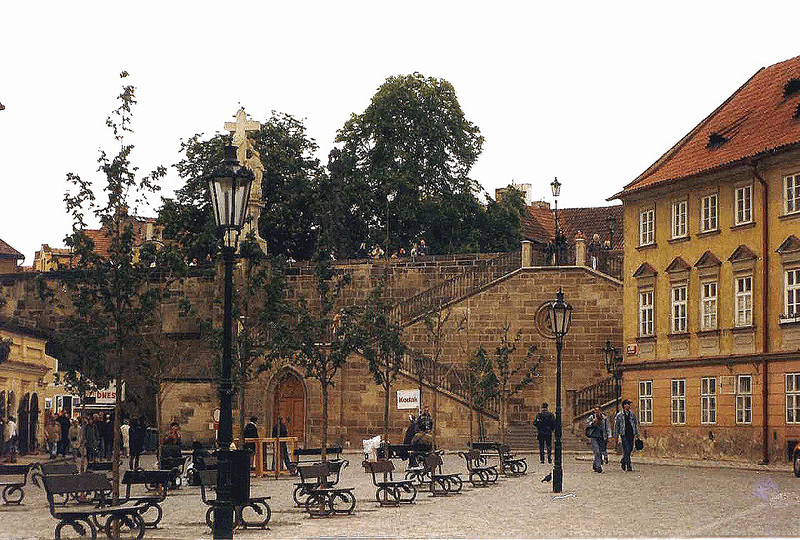 He also took us through Zlata Ulička [Golden Street - a collection of tiny houses on the castle grounds, one of which Kafka lived in for a time] then down the long hill from the castle into Malá Strana [on the same side of the river as the castle, below it], then over the Charles Bridge into Staré Město [Old Town] and its famous central square, finally to the edge of Václavské Náměsti [Wenceslaus Square], where the old town ends and the new begins, the final stop on the tour." A private tour guide? No, we were not then nor are we now in 2014 made of money, but at that time in my travels I relied on packages. Along with the flight and hotel the travel company we used threw in a ride to and from the airport and a half-day walking tour. It was a very reasonable price. If only it were that inexpensive now! "After the tour we strolled around a bit, then mom fell - oi! We picked her up and ducked into a nearby restaurant, to make sure she was all right as well as to eat. The restaurant proved a lucky choice - and it was filled with musical instruments, a delightful sort of decor. goulash and dumplings and I could LIVE on it - accompanied by pivo [for those Czech-challenged among you, that's beer]. Mom recovered and we continued our walk after lunch. Mom bought some crystal, we stopped in at St Havel's church, then headed back to Staroměstské Náměsti [Old Town Square], tried to get into St Mary before Tyn [aka Our Lady before Tyn], but the interior was closed for restoration, though we got a glimpse of its ornate baroque altar, then a stroll across the square to the Church of St Nicholas, designed by C.I. 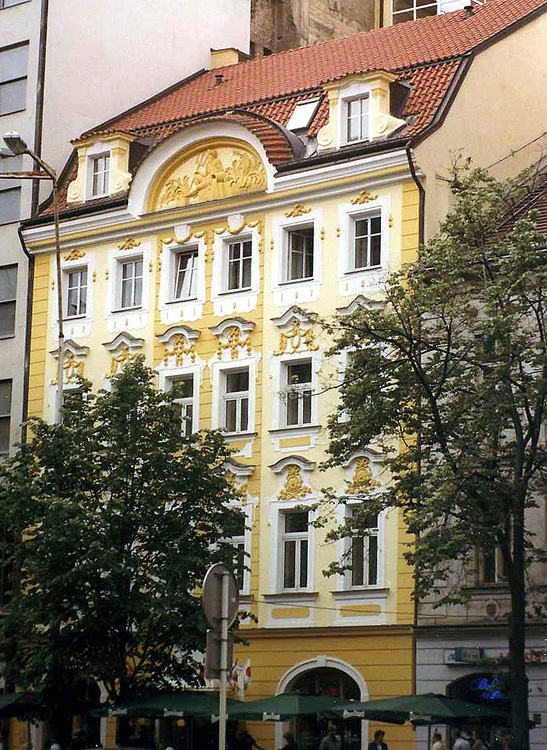 Dientzenhofer. [probably the most famous of a family of architects working primarily in the seventeenth century. By the way, does it seem that we're looking at a good many churches? Hey, we were a good Catholic family!] 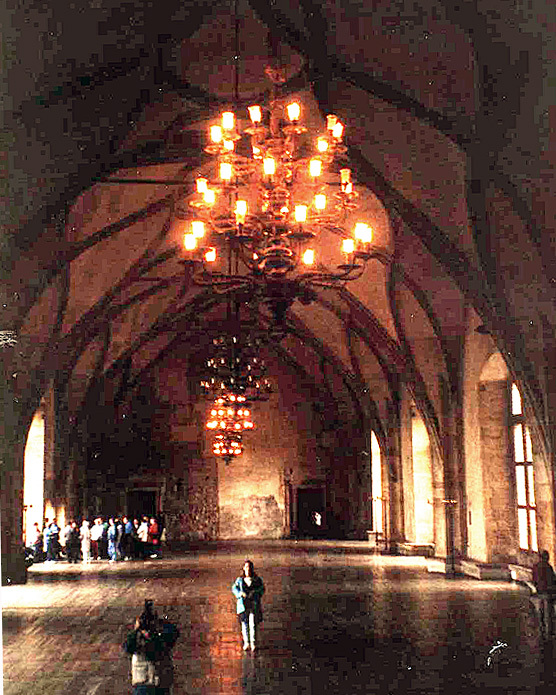 The interior was smaller than I expected, and less ornate as well, because it's now used by a Hussite congregation." "Stumbled on through more of Staré Město until we found a taxi, and, after a sight-filled ride back got to the hotel, for the rather hefty rate of 570 Kč. [See below for much more on Kč.] And now I'm ready for a nap before we head to the opera! We're seeing Verdi's Don Carlos at the Státní Opera tonight at 7. [While the real Don Carlos was Spanish the opera, written in Italian, is usually called Don Carlo - not so at the Státní production.] Both shows I tried to get us into at the Estates Theatre were sold out - VERY unfortunately - and for now, that's all!" 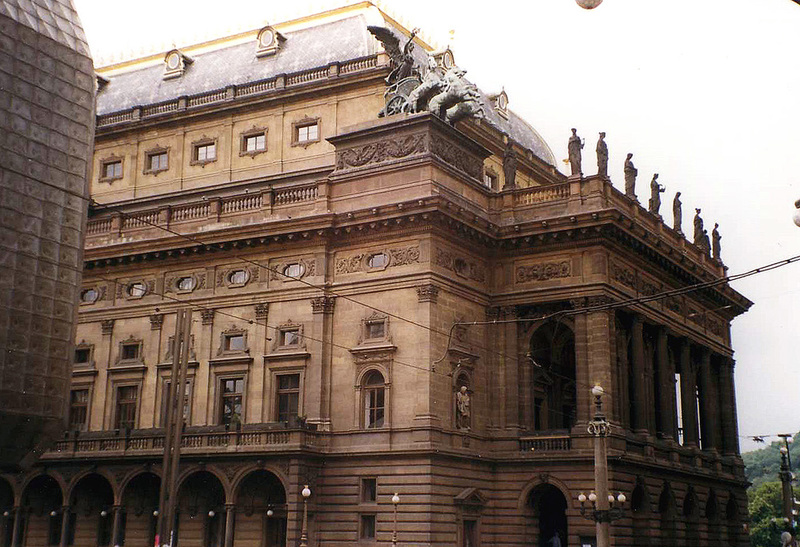 Thursday 21 May (barely) 12:03 am: Just got back from a lovely evening at the Státní Theatre. I hadn't seen Don Carlos before, and while this production could hardly be called revealing, it served very nicely as an introduction to the piece. And it was placed in a little gem of a theatre, perhaps a bit tacky for some tastes, built in the late nineteenth century (1888) to look a bit like those of a century earlier. We had excellent seats just off center seven rows from the stage for less than $30 a ticket!" "Tomorrow morning we head back to the Hrad [Hradčany] to see the interiors of all the exteriors we were teased with today...and now to sleep!" of Jesus) House in Nazareth. The house had been transported by angels, so the legend (or lee-gend, as our guide Alex pronounced it) goes, to Loreto, Italy in the thirteenth century. 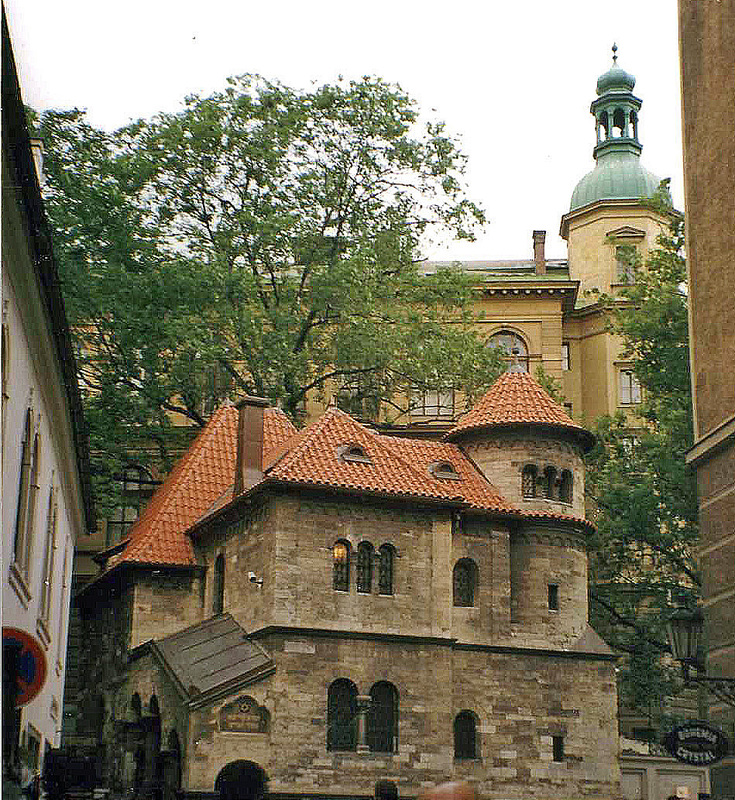 [Note from now: I did not mention in the journal that several replicas of that house had been built throughout Europe, Prague's version in the sixteenth century.] The shrine was crowded with tour groups [and probably some on pilgrimage] and was only of marginal interest to me. Then we continued on to the castle, through a series of squares that leads to it. 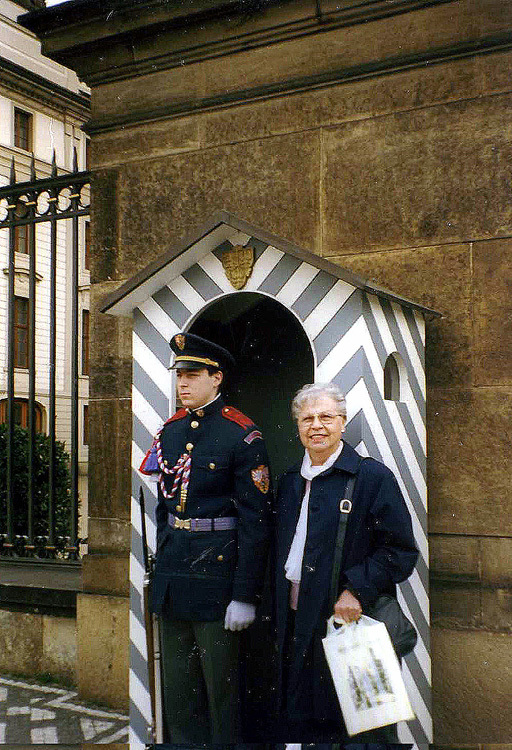 On the way we stopped to buy souvenirs, and for an emergency early lunch - mom suddenly had to pee, there was nowhere to do it, so in we went to a lovely looking place that had the least good food we've had in Prague...which is not to say it was bad. The garlic soup was tasty, the cheese platter that I ordered was nice, but it was over-priced. It seems that, near the castle, everything is!" 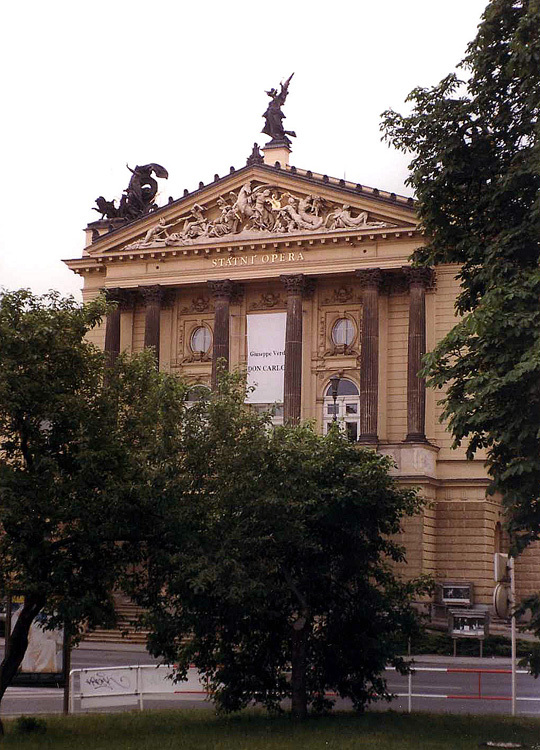 "Finally, in the rain, on we trod na Hrad [to the castle], but stopped first at the Sternberg Palace, then on to the National Museum, which was decidedly under-whelming. I suspect there was more to it than we were able to see, but we never found the twentieth century art, or even that of the late nineteenth - Kokoschka's views of Prague, for example...ah well, it's that kind of day. Still raining on us, still with our umbrellas, we arrived at the castle gates, bought tickets good for three days for entry and nearly all the events at the castle. We started at the Cathedral of St Vitus, making our way into the oldest, Gothic portion - quite impressive, I must say - and walked around the chapels in the ambulatory, where we saw the grave of St John of Nepomuck [patron saint of the Czech Republic, and of floods - look him up if you want to know why], a gaudy, baroque nightmare by Fischer von Erlach. As I write this, the sun is shining, brighter than the entire day has been! Again, it's that kind of day, but the cathedral was majorly impressive!" months ago), and also where jousting took place! 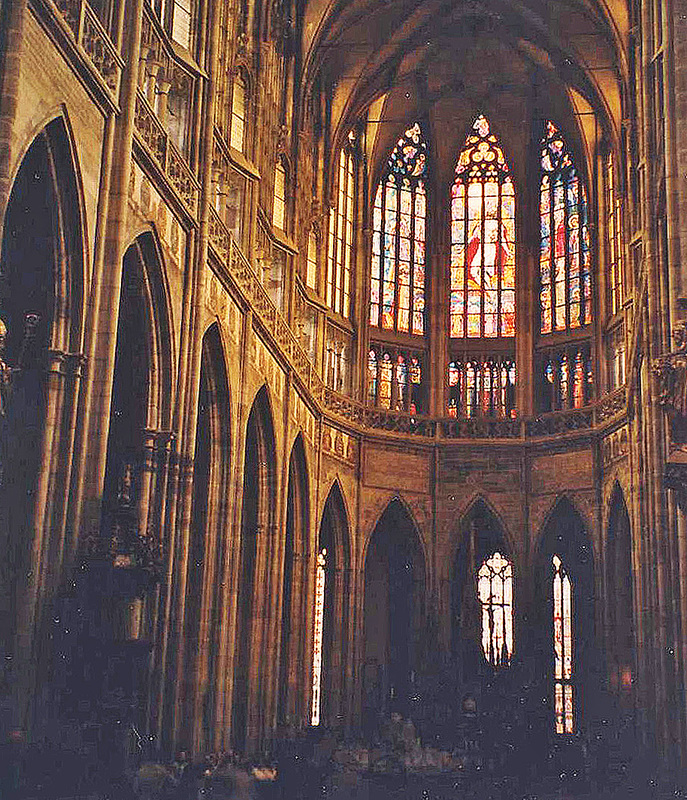 Up a few stairs to look down upon a beautiful chapel, to the hall where kings met the Diet, then outside to a magnificent view of Prague, spread out below us." 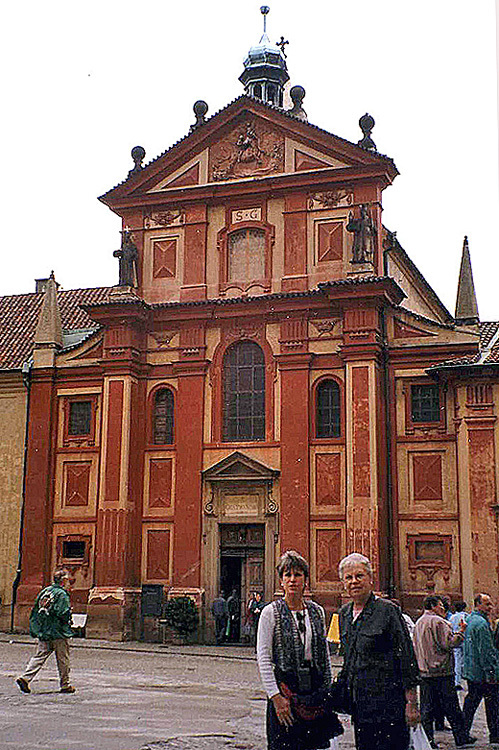 "From the palace we entered the Basilica of St George, from the Romanesque era, the first of those I've seen, with a facade from a later date. Lovely interior, and concerts are played there - we missed one today, actually, by exhausting ourselves before it started. Hmmmm...it's set to start just about now as I write...ah well...that kind of day." 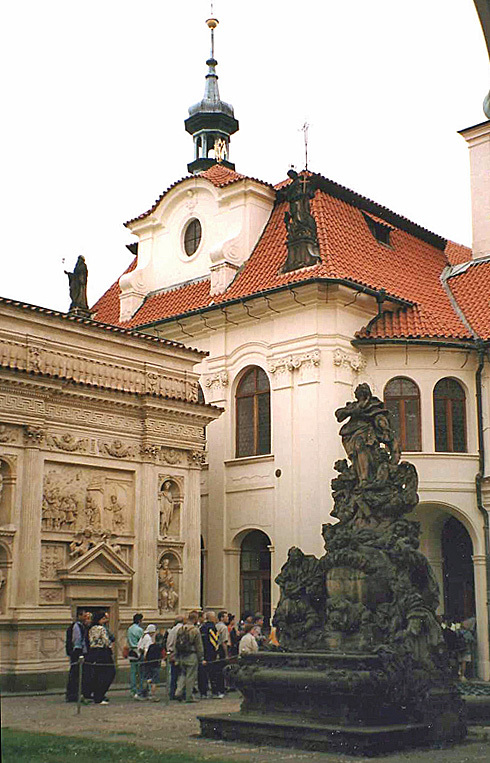 "Next to the Basilica was a collection of Old Bohemian Art, a really well-intentioned but fairly uninteresting exhibit. On from there to Zlata Ulička where we were able to spend a little more time than we had on our guided visit with Alex. We intended to walk down the stairs, but the rain picked up and we retreated into the gift shop, where I broke down and bought the large Mucha poster of Sarah Bernhardt as Camille! We headed back to the castle gate to look for a taxi - bad idea, as it turned out. As I've frequently noted, it was raining, the tourists were out and so were the bilkers. The taxi driver we chose told us, after we were out of the square and heading toward the hotel that it would cost us 1500 Kč - a trip that on the way TO the castle had cost 350 Kč! So I started screaming, said I'd pay no more than 500. Our taxi driver called another driver and took us back to the castle gate, where our new driver very pleasantly agreed to 500 Kč. That of course was 150 Kč more than we had paid on the way over, but I was forced to take it. Of course the two were in collusion - good cop/bad cop kind of scam. Oh well, I say again, it was that kind of day!" FYI from 2014: Kč stands for Czech koruna, or crown - to give you a sense of the conversion to the dollar, 350 Kč at the time was about $12, $500 about $16, and 1500 nearly $50. I just checked and today in 2014, 1500 Kč comes to about $75. "It has clouded up again since I just wrote that it was sunny - the weather is very volatile, in fact I think I'll turn on the television to see if I can find out the weather forecast, so we can make some decisions about what to do tomorrow. But more soon, I promise - and with all the problems we had, with it being (as I seem to keep repeating) 'that kind of day' I must say that it wasn't all that bad a day!" So, if Dottore Gianni may sum it up to suit the theme of this series: What seemed a largely Giù day became, in retrospect at least somewhat Su! 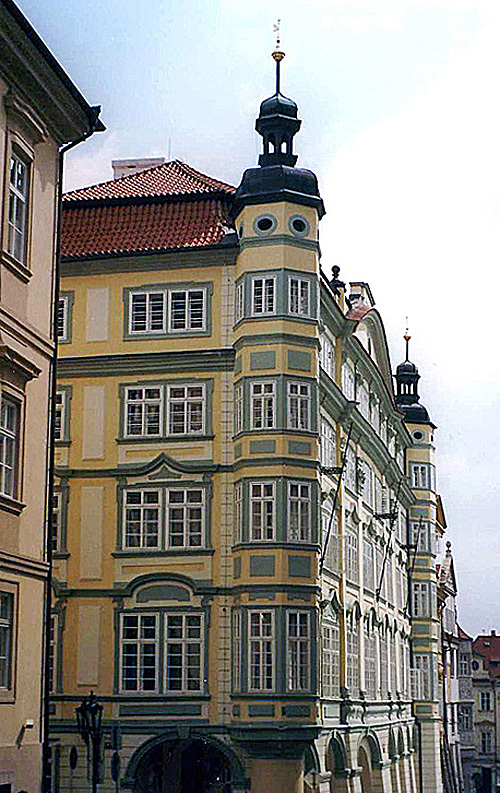 in Prague, built by the Dienstenhofers in the early eighteenth century. We strolled and shopped - strolled? Lots of traffic and very windy mid-50s weather - not perfect for strolling. Judy and mom looked around in an artsy little store and I bought an etching on the street from a tall, willowy, artsy young woman. [Dottore Gianni insists on asking, "Was it the etching you paid for, or the beauty of the woman?" Shut up, Dottore!] Then we found the Waldstein Palace and gardens, dominated by an odd quasi-stalactite effect that was apparently quite popular in the eighteenth century, though I've not seen it before. And wandering through the gardens, along with us, were at least three beautiful peacocks! We came upon St Thomas Church, a little gem that used to house two Rubens paintings over its altar - only copies there now. Also in the church were two fully clothed skeletons of saints - well, that's one way to worship, right?" 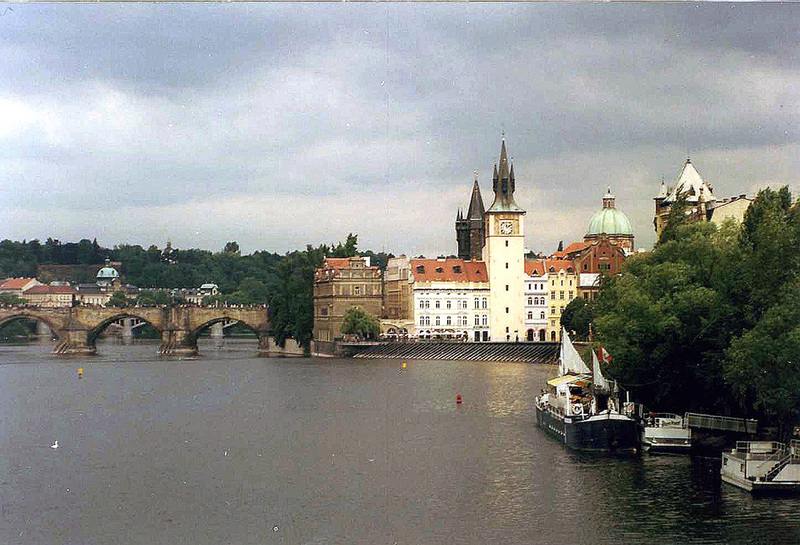 which featured the original chapel under the church, and down an unwieldy staircase, the remains of the Judith Bridge, the first bridge across the Vltava in Prague. We found this out from an attractive 30-something redhead, who gave us all sorts of info about several paintings in the gallery. Of COURSE, in front of this woman I could have loved, I fell halfway down the precarious stairs - my usual unintentional stunt when in the presence of someone I want to impress! In addition to the paintings there was a roomful of chalices and monstrances from the Knights of Malta, if I'm not mistaken." Another comment from 2014 - Jack, you fall in love too easily, you fall in love too fast, to paraphrase an old Sinatra song - at least he sang it in the film Anchors Aweigh, which is how I got to know it. the busiest section of the city. We finally found a nice place, not too expensive - actually, I protest too much, because even with drinks I don't think we spent much more than $10-12 a person for meals in Prague. And NONE have been bad, a few quite delicious. After lunch we walked through Staroměstské Náměsti, still without seeing the workings of the clock!" Hello again from 2014. I should explain what i mean about "workings" of the famous astrological clock on the square. 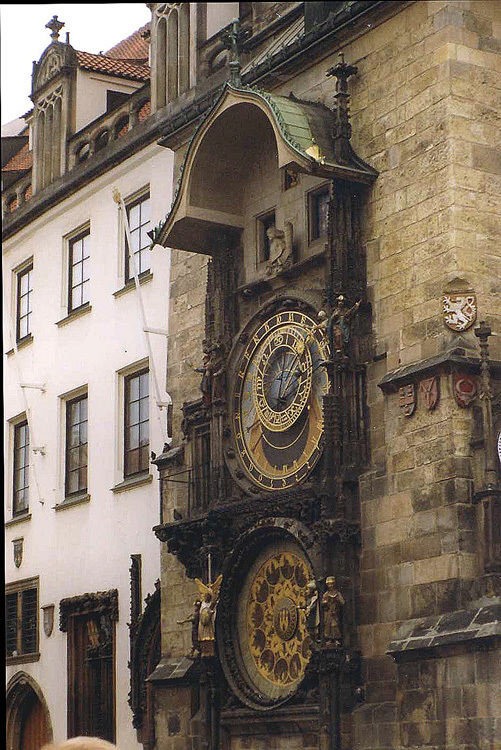 Installed in 1410, it is the third oldest such clock in the world and the first one still in working order. On the hour the clock puts on a sort of show, with mechanized figures doing a sort of march around it. But if you don't get to it ON the hour and you're on a schedule, you tend not to waste time waiting for this show, and keep walking. I don't think we ever saw the show on this trip, though I did on subsequent ones. 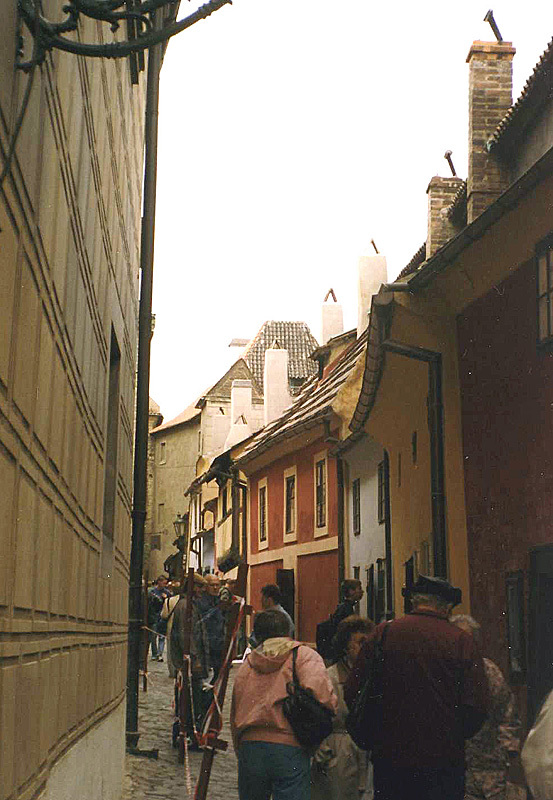 "We then spent some time in Josefstadt, the old Jewish Ghetto, fascinating! 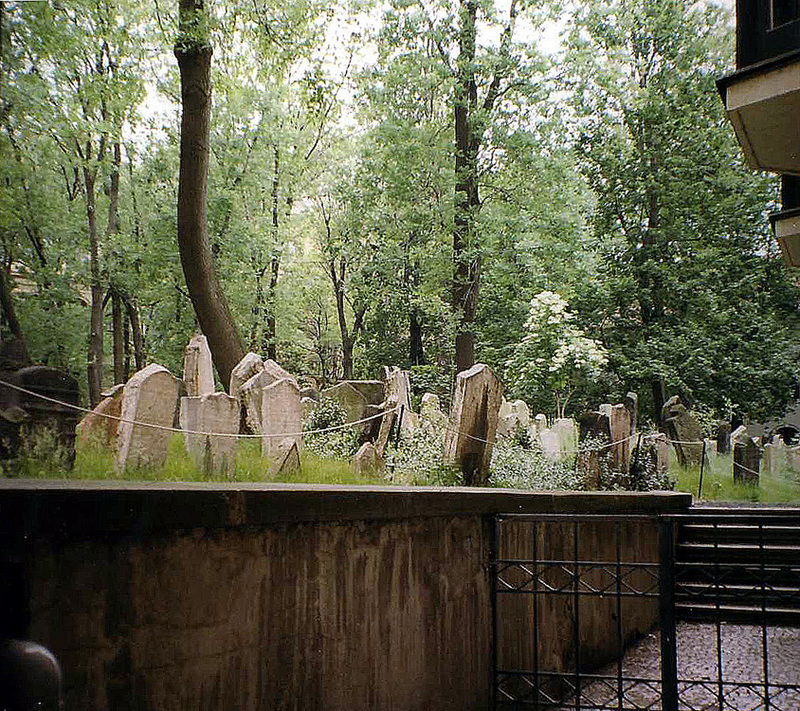 Synagogues crammed together, a graveyard similarly, eerily crammed. We made our way to the metro stop and took the train back to the hotel, an inexpensive alternative to taxis, and fast as well." "Tonight we're staying at the hotel to attend some pricey (and probably frankly for tourists only) Slavic entertainment in the Vinarva, or Wine Bar. I opted out of a production of Othello [the play, not the opera] at the Estates Theatre, a noble act on my part, to be certain, in favor of an entertainment we could all enjoy. While I'd hoped for more than one, it looks like we may not be able to go to another opera tomorrow night, but I have to say that after a long, tiring day of touring I don't really mind all that much." "Well, nearly time for wine, pork, and Slavic dancing! But more from me, of course, tomorrow." did I've forgotten what she told me - I looked it up and saw that in Czech it's haluski or halushki] - another concoction of dumplings, meat and sauerkraut." 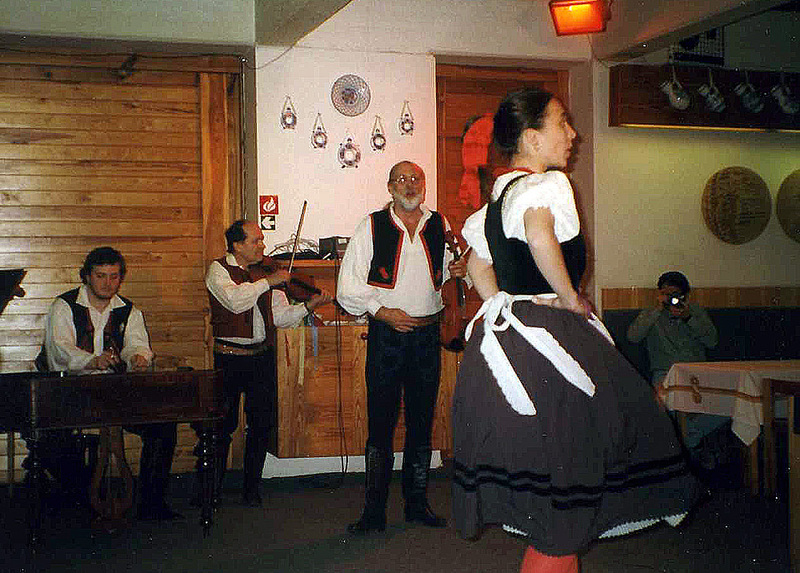 "A slick entertainer who spoke in French and English to the crowd, led a great traditional band, string bass, two violins and a cymbeline, and two beautiful young dancers (Dasha - whom I fell in love with almost immediately - was the female's name0 performed excellent folk dances. The most exciting moment for me came when Dasha asked me to dance the mazurka! Others too were brought from the audience, and I brought mom - oh yes! And we did it, simple at first, then in a circle, switching partners, so that I got to dance with Dasha. Then Dasha chose me for the polka and others danced it too - I was placed with a beautiful and slightly triste French woman...ah! Then more wine, palačinky [a crepe-like pancake - yum!] for dessert, and the evening was quite complete. I should say that the band minus the dancers came back for an energetic set - this was my favorite part of the music. The band played soulful Bohemian melodies and sang them - a lovely end to a grand evening!" Su! But, a question from time present: or was I just completely snockered?!? Either way, I still remember it as a great time. But I fail to note one thing I remember all too clearly - I really screwed up the polka! "I can't dance, don't ask me!" with apologies to Fred Astaire and any dance partner on whose toes I have clumsily trod. then took the metro to Wenceslaus Square and spent a good bit of the morning wandering through it - a bit disappointing actually, to my surprise. 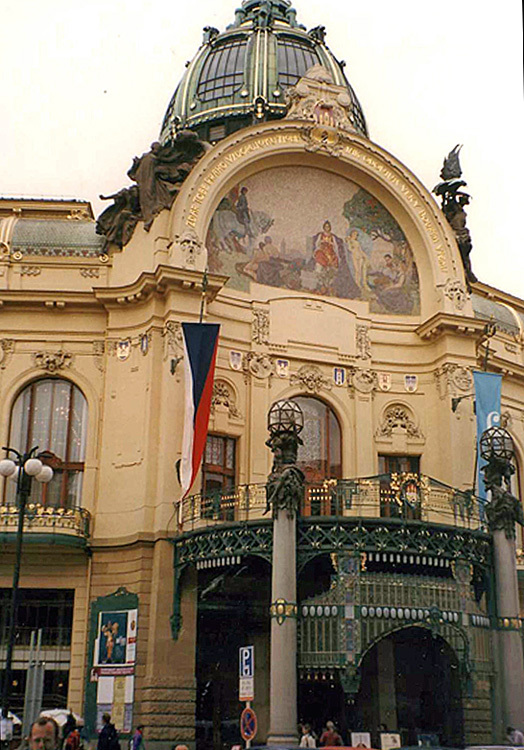 Then we headed west to the river and the National Theatre, after which we trekked back to the Obecní Dúm [the Municipal House, beautifully designed in the Art Nouveau style]. We had lunch in a pivnice there, Czech family style, seated with a friendly group of Germans. I had the old Bohemian plate, which proved a winner - duck, pork, ham, sausage with dumplings and sauerkraut. After lunch we wandered along Celetná Ulice where I found a little theatre bookshop that sold beautiful puppets. I bought a couple of books and chatted with the nice cashier who told me, sadly, that Czech theatre was in real danger with no state support." Obecní Dúm - lunching in the Pivnice! "Mom has been begging to attend to a concert in a church, and we found one at St Havel [aka St Gall, one of those Irish who saved civilization], featuring organ and soprano. It was quite lovely, lasted from 5 to 6 pm and after our very long day we took a crowded metro back to the hotel. After a rest we re-connected, had sandwiches and too many beers downstairs, and I'm now back in my room ready - more than ready - for sleep. Tomorrow is our last full day - looks to be cold and rainy, but we'll have what fun we can..."
St Havel's Church, where we saw our concert, is in the background - great veggies in front! Sunday 24 May: Back in the hotel at 4 pm today, not quite as long a day as yesterday, but long enough for me, and sadly a little too long for mom - she hurt her left ankle and foot, so we got the metro after a late lunch, returned to the hotel and will not go out again tonight - so! End of Prague!" Germany and Austria in big musicals. What a coincidence - and a great surprise! We had a short but happy chat. 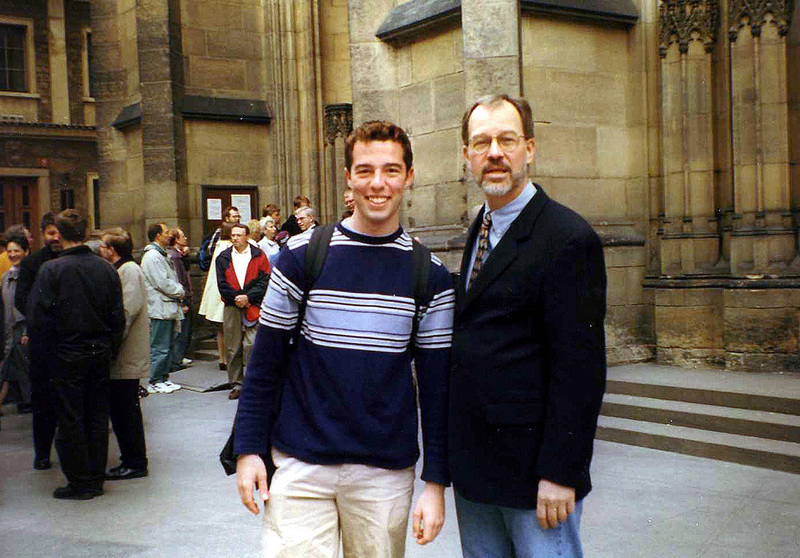 I declined to go to the theatre with him tonight, as this was our last night in Prague, but it would have been nice. While I was talking to Jonathan, Judy was chatting with his cute Australian friend (they had met at a very inexpensive pension - $20 a night - I need to find places like that next year when I am again heading abroad). While we were chatting with Jonathan and friend, mom was talking one of the guards into letting us in for mass. 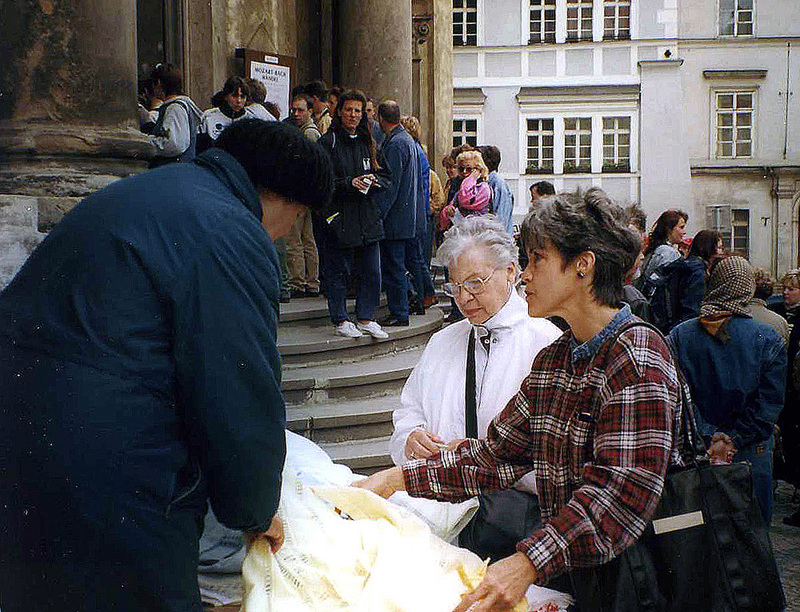 It was a tiny service, as the 'technical reason' was a concert the night before, by the Czech Symphony. Sorry to have missed it, but it may well have been sold out long before our arrival. So most of the new section of the cathedral was closed off, and only the old section open for this mass in Czech, with interestingly enough, the consecration done in Latin. And it was impressive to be back in the beautiful old Gothic section of the cathedral during a service. Mom received communion and an organ played, sounding if not hugely impressive, very pleasant." is he the one who let us in to mass? 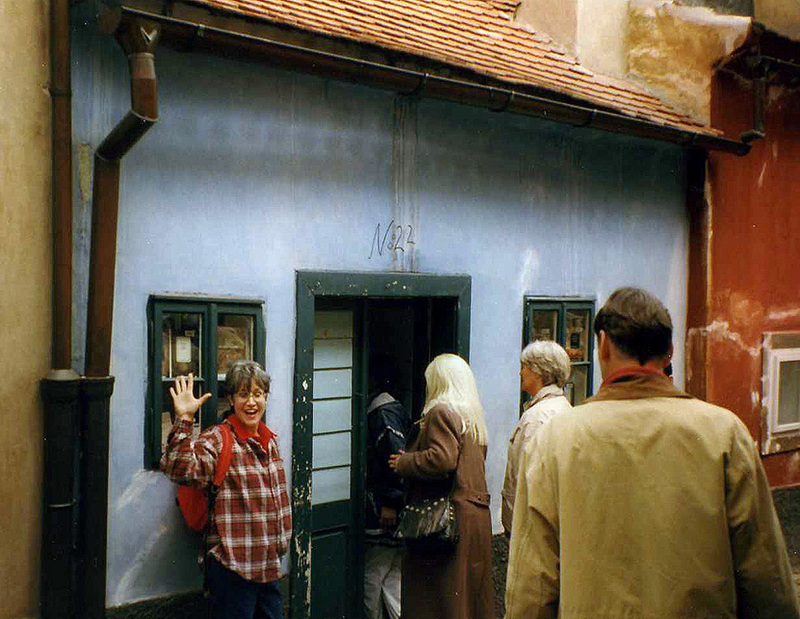 stroll along Zlata Ulička, that narrow street on the castle grounds crammed with tiny houses, in one of which Kafka had lived for a time. Okay, THEN the gardens, and down the old steps into Malá Strana, after which we started seriously to look for a restaurant. After walking through some of the tiny streets - my guidebook reminded me it was in these streets that parts of Amadeus were filmed, and it was easy to see why - we crossed onto the island called Kampa, separated from the mainland by Certovka, 'the Devil's Stream.' I'd hoped to find a restaurant on Kampa, but mom was getting really tired and her foot was hurting, so we settled for a restaurant with a French name (but Slovak food), Bel Ami, in a small square. I won't soon forget the excellent pork, sauerkraut and palačinky I ate there!" Our last full meal in Prague - and oh it was fine! 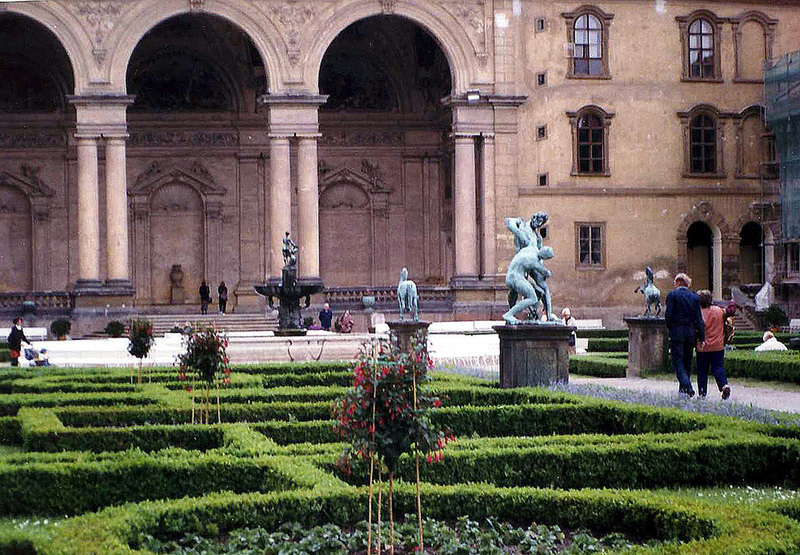 Beautiful square near the Kampa - Amadeus, anyone? "There was a view of Charles Bridge from our table (it was nice enough to dine outdoors), and as luck would have it the route of the Prague International Marathon, which is being run today, passes through our little square - we saw the very last contestants run (if that's the word) by on the last leg (on THEIR last legs) - less than a kilometer for them, over the Charles Bridge and into Old Town Square." "After lunch we made our way along a charming stretch of Malá Strana, very near the water, many of the apartments, I'm sure, offered views of the river and bankside. Then we arrived at the Malostranské Metro station. A short ride and a limping walk, for mom at least, and we were back at the Hotel. We'll probably just have a sandwich downstairs tonight, then off to the airport, with the help of Alex, who will pick us up at 9:45 am...at which time, really this time, farewell to Prague. Well! All for now, one or two more entries perhaps, to wrap up. Loooong day tomorrow!" 25 May: "I write for the last time in the Czech Republic. We're taxi-ing out on the tarmac, about to take off on our flight back to Newark. 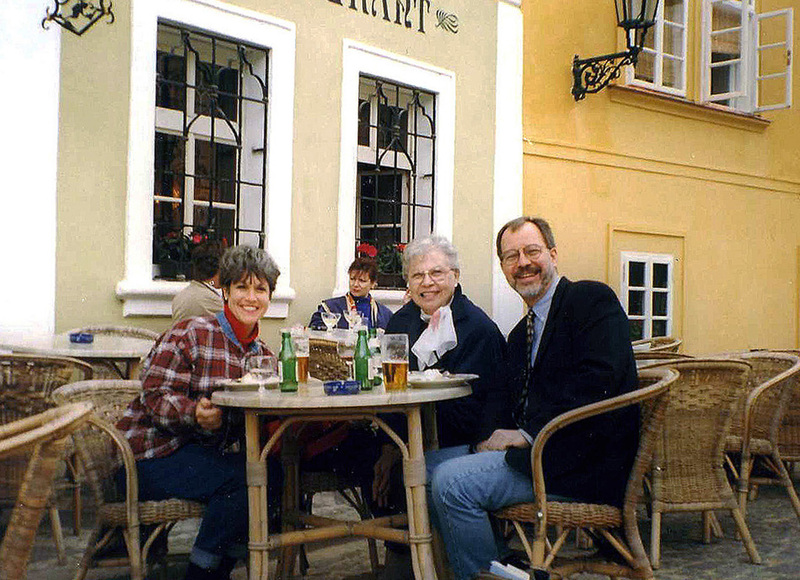 Last night Judy and I had a few Pilsners at the hotel and mom had a mediocre white wine. Then sleep, then the last breakfast at the hotel - we have been very well fed before each day of touring here - then a ride to the airport, a few little problems there - the handle on mom's wheelie bag would NOT go back down into its niche - and now, as I write these words - take-off! 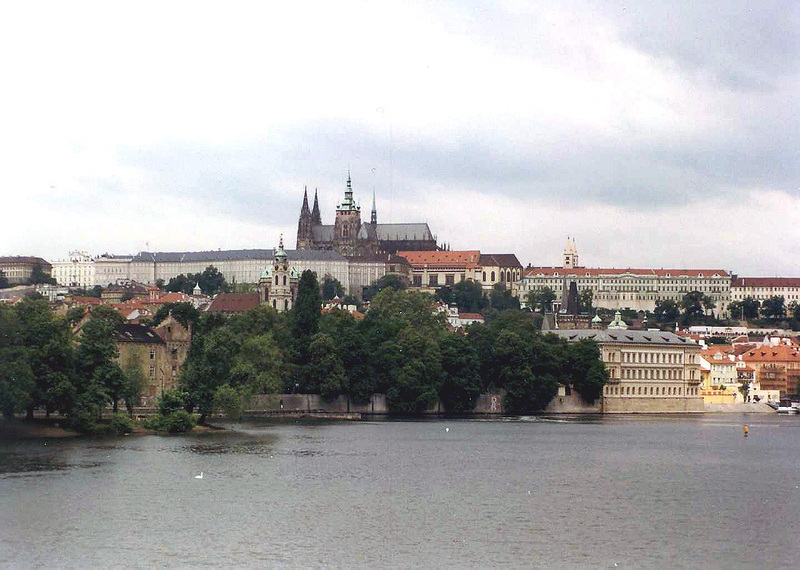 Na shledanou, Praha! I may return to you in less than a year!" 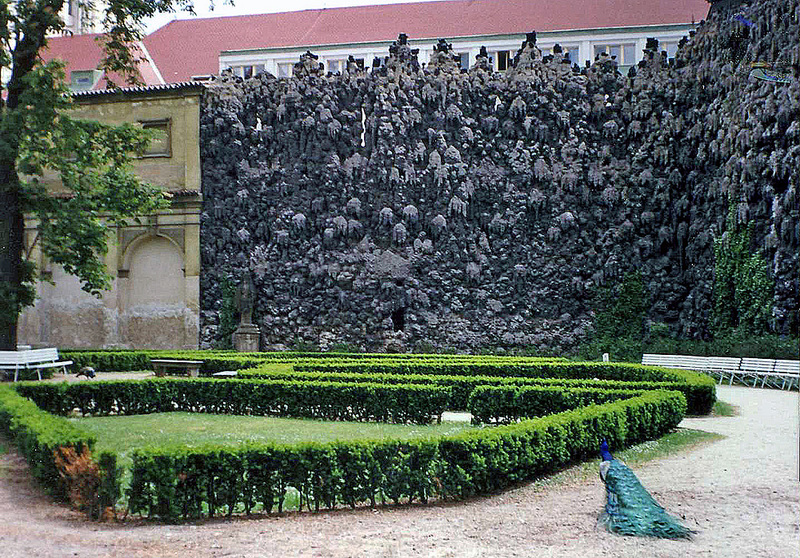 Another of the Waldstein Gardens, this one featuring the quasi-stalactites that cover some of its walls, as well as a peacock! allows his much younger second wife, an actress, to manipulate him, and thereby manipulates the country. Just one example...but for Jack the tourist [important note - he was Dr Jack Hrkach, not yet known as Dr Jack, and certainly not as - excuse me, make that for his very close association with - Dottore Gianni.] 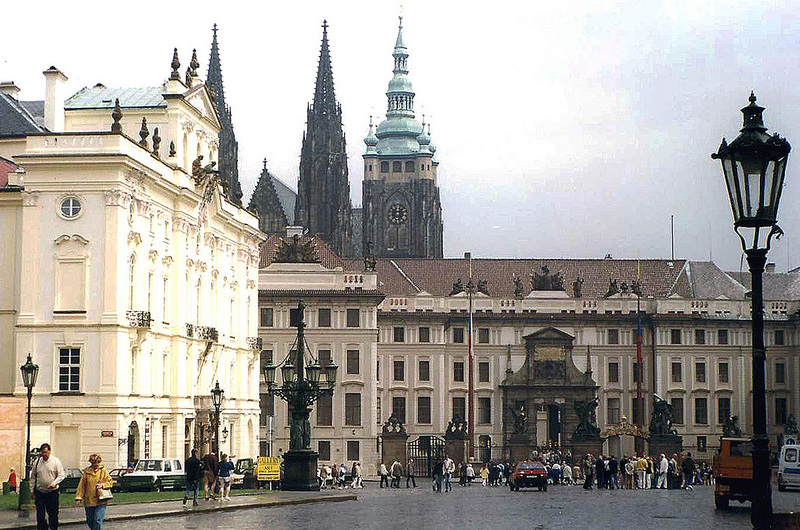 Prague WAS golden, a beautiful experience in Medieval, Baroque and Art Nouveau styles. Looking out from the Castle Gardens over the ruddy rooftops of the city and across the river to Old Town and the National Theatre yields a stunning view of one of the only cities in Europe to make it through the nightmarish bombings of World War II nearly unscathed." "And yet, it doesn't hold the same allure as Rome, for me at least. I can't really say why, except that for me Rome was a more sensuous experience...ah well, one cannot choose the person one loves (at least I don't seem to be able to). 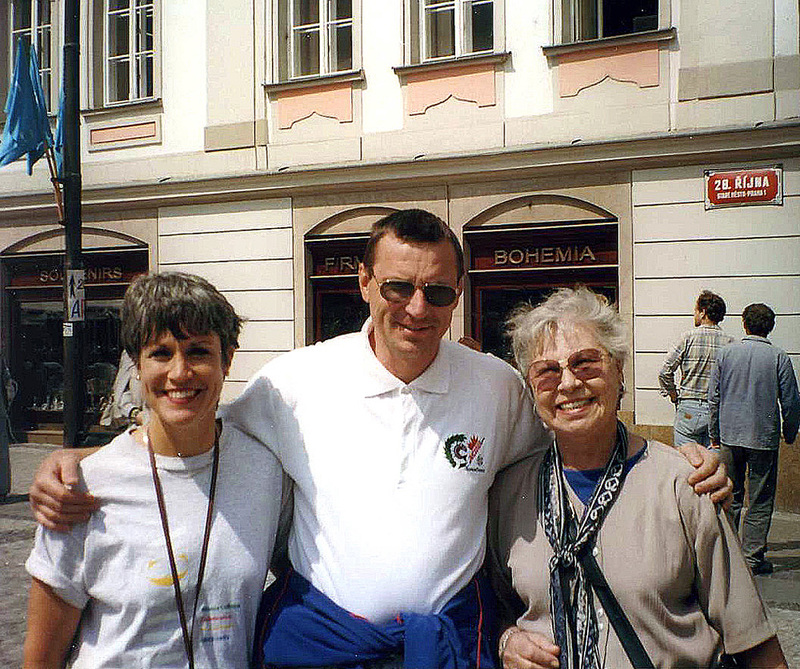 Prague is golden, an eminent city and a grand choice for the likes of me, mom and Judy to have visited. I thoroughly enjoyed it, but I loved Rome." "Spoke to Mom on the phone. Everything went smoothly for her, thank God, after I left her and Judy at Newark Airport. I hope the same was true for Judy, and I hope I find that out soon." "Meanwhile, after Prague, I realize that the summer spreads itself out before me, and I sigh in relief. 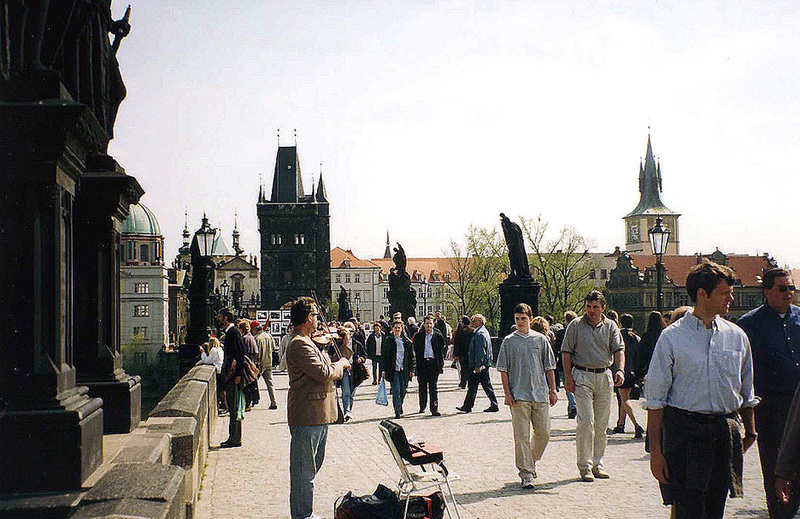 I realize also how much energy I've spent in the last months on Prague, and how, after a large breath of air I can begin to focus time on other parts of Europe, to those places I'll visit next spring...and THAT is the end of the Prague journal!" A few after-thoughts from 2014: Mom proved a real trouper on this trip! In her mid-70s (I only hope I'm still able to travel anywhere at that age) she endured long walks, fell once, at least (am near certain she fell more than once, as Judy and I darkly and somewhat sacrilegiously joked that "Ethel falls for the third time..."). We'd be walking along one of the cobble-stone streets, look around and there she'd be, down on the ground. Oi! But she always picked herself up, dusted herself off, and started all over again. She also put some strain on her leg and foot, and I don't remember complaints - Judy may, as she roomed with mom. She did rather well on our subsequent trip to Italy (with Judy and our Aunt Roseann), though not so well on the final trip I took with her, to Munich, Salzburg and Vienna - more about that trip, on which Aunt Roseann again accompanied us. 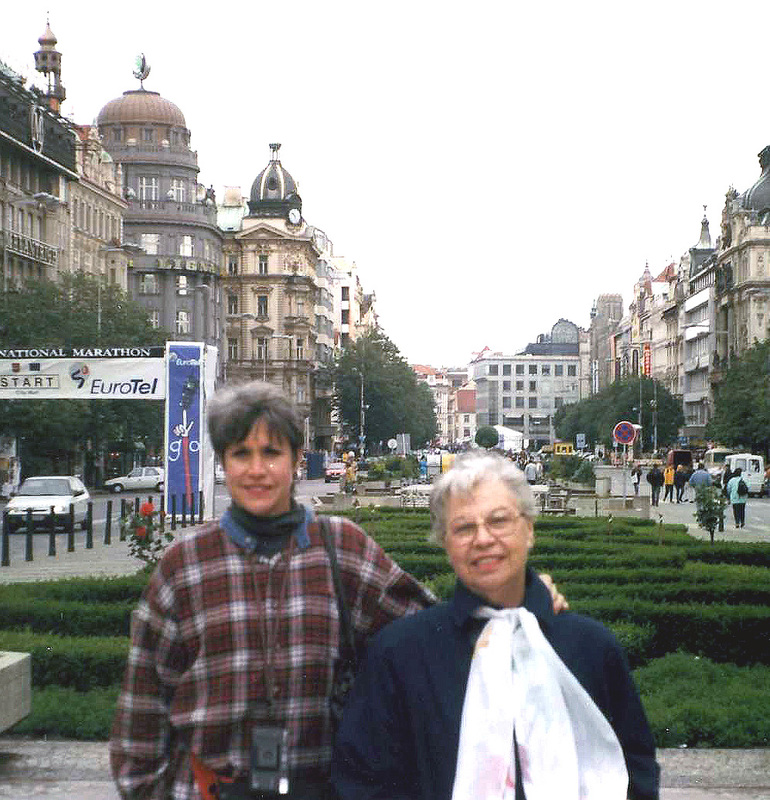 But particularly as I look back to earlier years where I was much more spry than I am now (as I am about to embark on another trip, this one to Ireland) I really admire her on every one of the trips abroad she and I took! 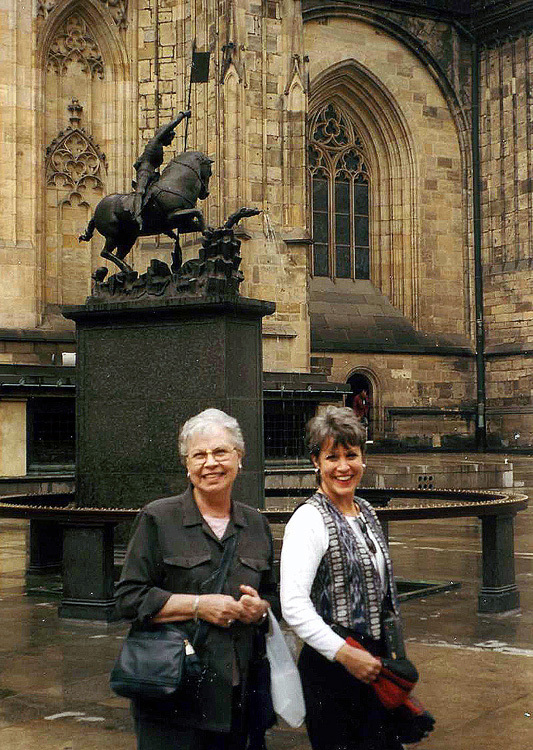 A great shot of mom and Judy at St Vitus - I'm so glad they made the trip with me! 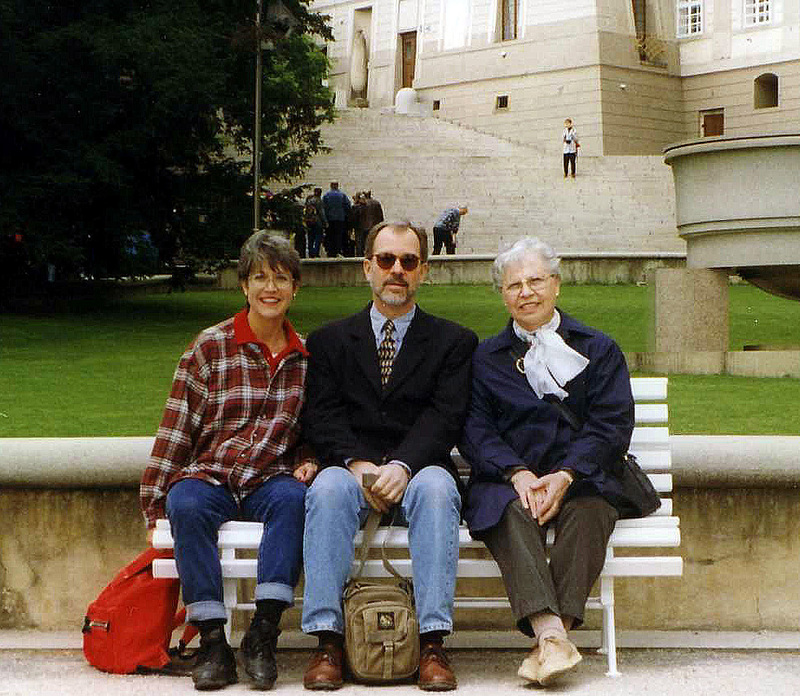 Also, I learned from re-reading the journal that...I must confess (Dottore Gianni forces me to) that, once an egotist, always an egotist - there is all too little in this journal about Judy, more about mom, but not enough from her point of view either. It's a fault, and I confess it freely, if a bit embarrassed as I do so. So! Discounting crooked taxi driver, rainy weather, mom falling and my near arrest, all in all I can testify that this trip was much more Su than Giù! And more from me and the good doctor very soon, I hope!